In general, a standard fume hood can be plugged into a 120-volt outlet while accommodations can be made for 240-volt outlets. Nearly all fume hoods, ducted and ductless, operate at a voltage that is safe for these outlets but it is always good to check the supply voltage for a fume hood which can be found on the rating plate of each junction box. The current coming into your laboratory is like pressure–the more individual electrons that are pushed through the electrical wiring, the more power that will be provided to an outlet. But this comes with caution as not every electrical wire and outlet are the same. 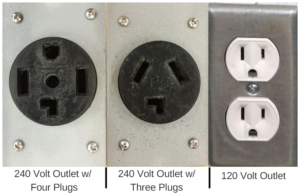 Some outlets can handle higher voltage, while others cannot. If you ignore this fact, products can overheat, leading to damage and possible fire hazards. The difference between a 120-volt outlet and a 240-volt outlet is distinguishable by its design. A 120-volt outlet is the one you plug in anything from your coffee pot to your phone charging cable. It has three individual plugs and is common throughout North America. A 240-volt outlet, on the other hand, is larger with room for three or four individual plugs of varying size. When are 240-Volt Outlets Needed? A number of appliances require more than 120 volts to run. Common appliances like a washing machine, dryer, and oven will technically run on 120 volts, but they won’t be as effective because they are designed for 240-volt outlets. An oven that is connected to a 120-volt wire will only produce ¼ of the heat it should produce when connected to a 240-volt outlet. If your fume hood is designed for 240 volts, would you want it operating at a less-than-optimal state? Know what type of volts you have in your facility to ensure that your fume hood is functioning properly and doing its job. Planning for electricity in laboratory design and layout is necessary. Know the location of your fume hood within your laboratory to ensure the wiring is adequate and function is optimal. If accommodations have been made and your fume hood has a 240-volt plugin, make sure that the outlet is appropriate. As mentioned, plugging a 240-volt device into a 120-volt outlet will impact performance. But plugging a 120-volt device into a 240-volt outlet will draw too much current and cause the fume hood to burn out. A protection device, such as a step-down transformer which minimizes the current to proper levels, will be necessary. 120/240 Volts or 110/220 Volts? This question is still raised. But the main producers of electricity in North America provide the residential sector with 120/240 volts that have variations of +\- 5%. Which technically means 120 volts can vary from 114 to 126 volts. Folklore indicates that voltage started out at 100 volts which was used primarily for powering street lights. When the public wanted brighter lights, the power company turned up the voltage to 110 volts. And as the demand for brightness increased, another change to 120 volts was formalized in 1984 by the National Electrical Code (NEC) which set 120/240 as the standard voltage. It is still common to see voltage labeling of 110/120 (or 220/240), but these ratings are used interchangeably. To complicate matters, some even split the difference and use 115 as a voltage rating. But for all intents and purposes, the terms mean the same and the true voltage at most receptacles is within +\- 5% of these values. National Laboratory Sales is happy to help with all your fume hood needs and questions and can let you know if one of our fume hoods needs a 120 or 240-volt outlet. But if you need help replacing an outlet or rewiring your facility for proper voltage, it is best to contact your local electrician.